Hey everyone! I'm posting this in hopes that someone out there still follows this blog, and that that someone has some spare dinero they'd be willing to put up as a stake. I would prefer the stake come from one person as opposed to having it pooled between 6 people as was the case the last time I was staked, but will make the concession if necessary. 2000$ stake for 100NL on FullTilt. I would consider playing on PokerStars, but the staker would have to convince me the incentive programs PokerStars provides would be equivalent (or better??) than the rakeback I receive on FullTilt. Stake is repaid once my roll has reached 6000$, the staker receives 4000$ and I keep 2000$ UNLESS myself and the staker are both confident with me taking a shot at the next level. If this is the case, then I would continue playing to a maximum of 10,000$ at which point the staker would receive 6000$ and I would retain 4000$. Any additional terms can be discussed. If this interests you, or may interest someone you know, please let me know. You can post a comment here or send me an email at: k dot e dot crouser at gmail dot com. So I skipped my first class last week. My grinding over the weekend was strictly and solely responsible. So I've (reluctantly) made the smart choice and pulled everything. Not sure what I'm going to do with the money yet, but I'm sure I'll think of something! 7,260 hands of 100NL at 12.10 ptbb. 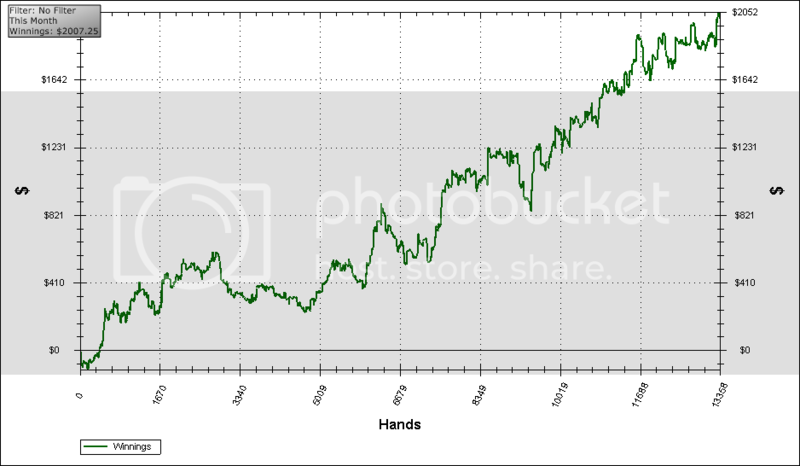 Which means lifetime at 100NL over 51,952 hands I'm running at 7.97 ptbb. And here's the lifetime 100NL garph for extra +bragEV. 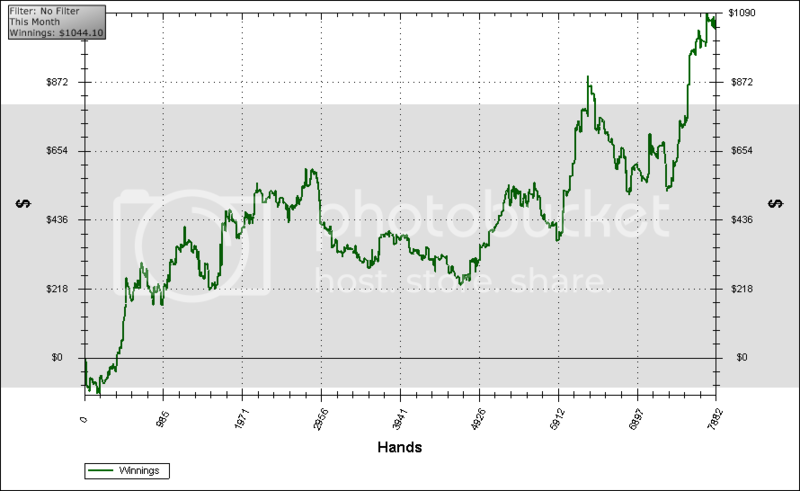 Might (probably) busto-robusto my next rakeback transfer of ~126$, so stay tuned for that. Otherwise, see you next year! It's nice that I've had more time to play this month than I thought I would. And by that, I mean I really haven't had time to play, I've just been playing anyways and sacrificing sleep mostly. I actually snapped the river in this one. His line makes no sense and he almost never has a 3 here. School and my ladyfriend are dominating most of my time, but I've had the odd time to play a session here and there. 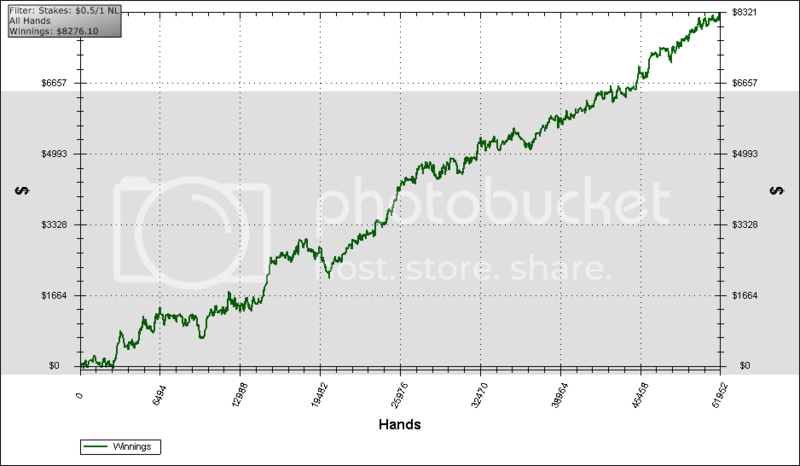 So the two sessions or so I seem to get each month now are devoted to trying to get a handle on NL HU, starting with 50NL. 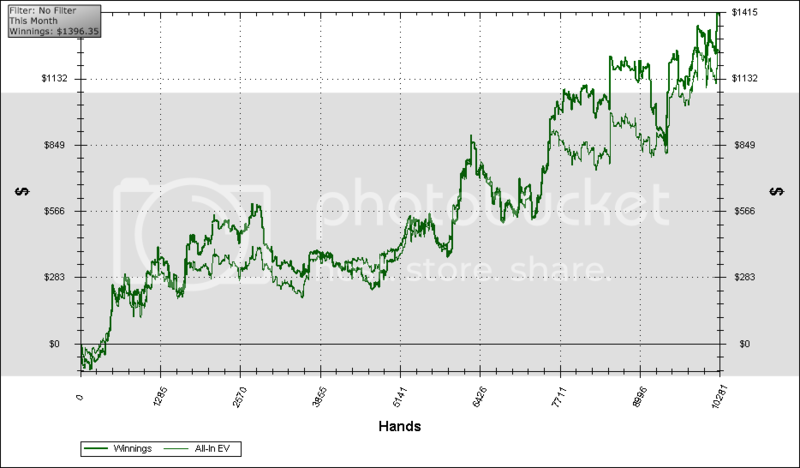 So far it's been mostly good (up ~8 buyins). There's (obviously) a story with this hand, but I thought it was pretty fun. Snap 250bb preflop with A4s? I think so. So I settled the stake tonight. With school coming up, a new (amazing) girlfriend, lots of work, going to Vegas... It all adds up to me not playing much poker. Rather, no poker. So I contacted my stakers, and everything is repaid. 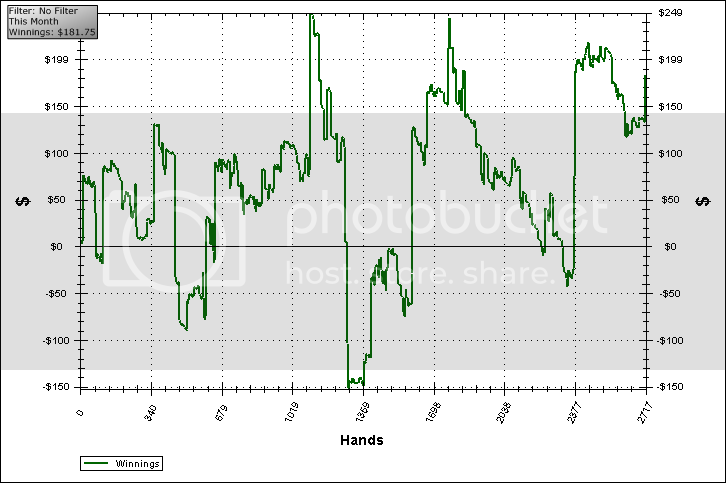 After a 50/50 split of the profits I'm left with just under 950$ to play with. I'm tempted to withdraw it right away, but I might keep it there until school has kicked into high gear, at which point I won't be playing poker again until after I graduate. Thanks a ton to all my stakers, I'm glad I could provide a decent (42% or so) interest on your investment. See you on the felt! ...Eventually. Did a lot of grinding today. First time in a while. One of the reasons for my extended absence (and there were many) was the repeated celebrations revolving around me turning 26. I didn't play great. Probably cuz I was playing too many tables trying to clear my 200$ bonus as fast as possible. Here's the graph. Hands possibly to follow. 60$ of bonus cleared, roll sits at $3,850 and change.